Not to be confused with the more famous Greensted, 20 miles off. 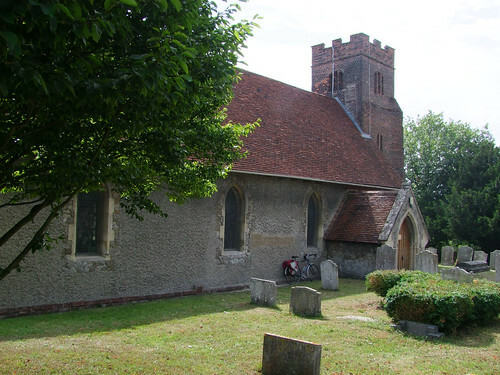 A few hundred yards above Hythe railway station in the suburbs of Colchester sits this odd little church. However, I found it locked, with no keyholder notice. A church of little interest except that the red brick tower is entirely 1600, a most unusual date. It would be interesting to know why they built it. Had the old one fallen? This is a landmark hilltop site, so was that the reason? The church against it is now 19th Century. There was a group of young 'Community Payback' workers clearing and tidying up the churchyard, and you would not have needed to be a maiden aunt to have blushed at the things they were shouting at each other, but they were very civil to me and I took advantage of the fact they had access to the kitchen area in the south aisle to photograph the one treasure the roundel royal arms to George I. This was through the glass of the locked inner door, I'm afraid. And then I at last broke free of Colchester's urban sprawl, because between me and the next church was Wivenhoe Park, campus home of the University of Essex, and beyond it Wivenhoe.